It would help if you explained what “fact checking” you’re referring to. Otherwise, glad you enjoyed it, and thanks for reading. Cheers! We sure did, sv…thanks for making it obvious. I’m not on to guess on numbers but it seems like cap percentage is the number we should be guessing at vs dollar amounts… but at anyway you cut it, like all star players, he’s gonna get paid. And like I’ve said in the past, spend your cap dollars on your stars and not replaceable players even if it costs you a good player. Looks like Sv has finished his new outhouse hole. I hope he doesn’t fall into the full one when he moves the top part over, like he did last time. I watched it on youtube with Paul Simons in the background singing “Slip Sliding Away”. Maybe it was The Chipmunks. Anyway, it was great! Gee, first post and, instead of talking Hockey or debating the merits of the article, you go straight to a personal insult. I would suggest you visit a proctologist to have your brain examined, but that would be a waste of the proctologist’s time. That is what I thought too…not a single hockey post prior to a giant negative blast. for all the things I love about the “new age of communication”, the anonymity Twitter and sites give many posters is how tough and nasty they can be when hiding electronically. Imagine- having nothing better to do, than criticize someone, who does a great job! I’ve been on here since it started, fellow PEI native. Great article. I feel this kid is the unsung hero.. durability is valuable as well. Eyes and hands send tap ins to Matthew’s n Tavares and they get the credit. Other teams know damn well and the offer sheets will come flowing. $11M or leave. Loyalty to yourself. I agree with you, Lyle. I’ll even take it a step further. There is no reason for Marner to accept anything less than Matthews received – including the shorter term. It’s certainly debatable which of the two is more important to the franchise. What isn’t debatable is the fact that Marner has Dubas by the tender parts. Give him what he wants before July 1 or match that offer sheet on July 2. Now , if it was for 7 or 8 years then yes $11M is certainly in line. Oooops ; fat finger typing ; weak eyes…..
That should have been “<$10 M"
Everyone slow down a bit. MM is definitely a superstar in NHL. He is absolutely ridiculous with the puck and the vision on the ice is unbelievable, what’s more incredible is that he is relentless in puck retrieval and rarely turns over the puck. His IQ for the game is in another stratosphere. The difference between MM and AM this year is JT. When you have superstar like JT as your center man who can finish, dish and engage in the corners it’s pretty sweet. AM on the other hand has an average at best in Marleau as one of his winger. 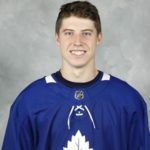 So let’s slow down on Marner’s bandwagon. Believe me, if AM had a winger likes of Panarin, Kane, or Seguin, AM’s numbers will be off the charts. Most of AM’s goals are byproduct of his lethal wrist shots. AM is one guy in the league who can change the game by a flick of a wrist. Dubas need to find a winger who can compliment AM with similar set of skills. Right now, the only available winger is Panarin. Leafs have one dangerous line that is Tavares line. The rest are just so so lines. Dubas need to weed out the floaters and really go after Panarin. I think Columbus might be interested in Nylander as he can play both the wing and center position. Panarin can be had for 7 years $65-$70 mills. That’s roughly $2.5 – $3 mill more than WN. But, the skill level is night and day. To make the numbers work, trade Kadri for a D man, and let Gardiner walk. If this scenario plays out you truly have one of the most dangerous 1 2 punch in the league. Once, Marleau, Kadri, Gardiner, Hainsey, Zaitsev and Brown’s Cap is off the books, Dubas can tinker to fine tune the rest of the roster. With Marner at $11 mill, Panarin at $10 mill, Kappy and Johnsson at $3 mill each for 3 years, you are looking at total of $49 mills for top two lines and about $7 mills for bottom two lines. A grand total of $78 – $80 mills Cap Hit for 2019-2020 season. PANARIN is very possible, if Dubas can work his magic. Matthews’s talent shouldn’t be wasted with Marleau in fact CAN NOT be wasted by Marleau any longer. As a Columbus fan I would probably agree that we would accept nylander for panarin. In an ideal world I believe jarmo and JD would want more but with what panarin has said and the fact he can walk at the end of the season that sounds like it is probably one of the better deals Columbus could hope for. However I think jarmo will keep panarin for a playoff push and trade bob, for another veteran goalie. Trading bob is harder though since he will have to approve it. Lyle, why would you allow such garbage to be posted on your site? We all know the troll for everything. Don’t let your site be a place for clowns like that to come and post garbage. I love watching Mitch Marner play and I don’t care how much they pay him. 8 x 10 would be a coup for Dubas. Would love to see it, but think 11 is more likely. Hoping he stays in Toronto for a very long time. I feel like I am probably the only guy in the world who thinks Marner is actually just better than Matthews. I’ve also found Matthews a bit overrated. He has a lethal wrist shot, but doesn’t play with passion or an edge a lot of the time. Marner, sure he has JT this season, but Marner is primarily a set up guy and he has a guy who is finishing his plays, even better than Matthews did. Marner has wheels, he makes magic happen all the time. I just think he is more valuable, like… Matthews to me isn’t even the best center on the Leafs let alone the best player. Now, IMO Matthews being the 3rd best guy on the Leafs makes them an absolutely scary team to face… just feel Marner is THE guy.